Students Angus White and Logan Lambert help Jason Baxter prepare the chicken dish. It’s hot in Africa, so, on one of the hottest days of the year in Aylsham, it was only natural to come up with a dish suitable for the occasion. 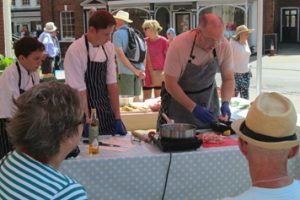 Students Angus White, Logan Lambert, ably assisted by Jason Baxter, head of food and nutrition teacher at Aylsham High School, demonstrated how to cook a Moroccan-style couscous with chicken at the Farmers’ Market on Saturday (7 July). “A quick and simple dish using herbs from the garden, and kitchen cupboard standbys, this dish will appeal to most people,” said Jason. 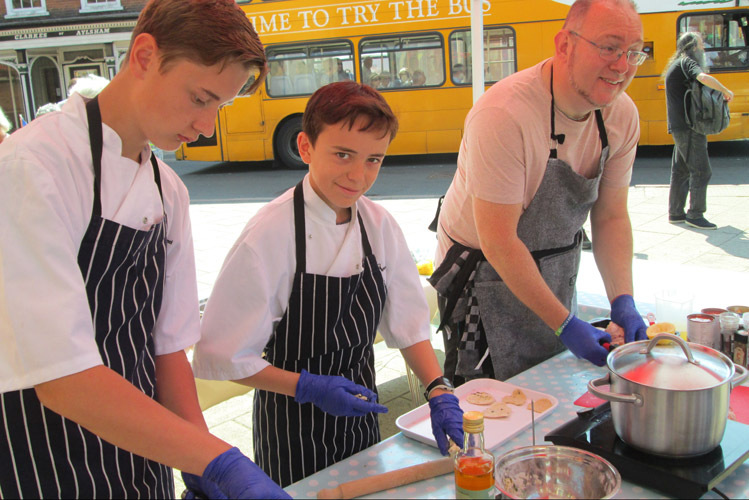 Would-be chef Logan, aged 13, paused from chopping thyme and chives to say he “enjoys cooking” while Angus “thought it would be fun” to show how it was done.